This post was generated live at Netroots Nation 2011 in Minneapolis, MN. I want to offer one more post today synthesizing what I addressed in my previous two posts today. In both, I spoke to the partnerships between groups and strategies that are often perceived as antagonistic, and in this third post, I want to make sense of that in a discussion about trust. Trust between individuals and groups can be incredibly difficult to build and requires outreach in both directions. Organizations need to be able to trust that the bloggers who may very well criticize them and hold them accountable are committed to the same efforts of LGBT equality. Likewise, bloggers need to be able to trust that the organizations are prioritizing the movement over the organization and that their strategies are an effective approach to the desired solutions. In the same vein, insider and outsider organizations need to be able to trust that the strategy of the other is ultimately contributing to the success, not creating new obstacles. In achieving this trust across the movement, risks have to be taken. Insider organizations have a particular obligation to earn trust with other leaders in the movement. By including them in off-the-record conversations about their strategy, they can entrust bloggers, direct action groups, and others with certain tips that can accentuate the campaign. Ego cannot get in the way of this happening; if any particular group or individual attempts to take full credit on an initiative, they are effectively eliminating the potential to build a coalition. Likewise, as skeptical as “outsiders” might be, giving the insiders a certain benefit of doubt goes a long way to building the bridge of trust from the other direction. There are definitely times when a blogger’s investigation can blow the lid on what might have been a very successful strategy. My hope would be that insider orgs see the value of blogger and queer media perspectives, even if it’s not the picture they would paint. Effective communication across that bridge can alleviate all of these problems; bloggers can honor the confidentiality of the big orgs as the orgs bring the bloggers into the over-arching strategy. I’ll leave it at that for now. This is a complicated paradigm change we must achieve, but it’s built on lessons learned from campaigns over the past decade. If we can tap into that greater synergy and see the interacting potential of diverse strategies across the movement, our in-fighting will come to an end and our success will be guaranteed. As groups debate the best strategy for moving an LGBT equality agenda, there is often a perceived conflict between the “insider” private negotiating and the “outsider” public direct actions, blogging, etc. As I’ve listened to the dialogues this weekend, it seems to me that the conflict is, in fact, perceived. While various groups, leaders, lobbyists, and bloggers might not agree with each other’s strategies, that disagreement does not mean that the strategies actually conflict. In stark contrast, the diverse strategies can actually create an incredibly synergistic movement if strategists use each other’s tactics instead of just worrying about distinguishing themselves. Unfortunately, egos on both sides and the absence of an orchestrator for the meta-movement seem to prevent this synergy from being fully realized. Some might not buy that argument, but as we realized in the LGBT strategy session yesterday, there is another very important benefit to those kinds of direct actions. Even if the action does not directly benefit the political negotiating, it indirectly supports the movement by generating media stories. Often times, there is very little happening in the news to sustain coverage of a particular issue (e.g. ENDA). Blogs cannot drive any coverage to the mainstream media if there are no stories to cover. Introduce a well-executed direct action, however, and we get breaking news, several days of coverage, follow-up for arrests and trials, and more importantly, personal faces on the issue. Even if insider groups cannot use the direct action in their negotiations, those negotiations still benefit from media attention and the shaping of public opinion on the issue. The outcome, inarguably, is synergistic momentum, and I think the DADT effort exemplified the way it can work. While some may try to paint a revisionist perspective, there was a sharp divide in early 2010 between activists and the Obama administration about what approach to take on repeal. The administration was opposed to pursuing any legislative repeal until after the military survey was complete, rather than concurrently. While it’s hard to argue what-if’s, I think there is a compelling case to make that direct actions by GetEQUAL and SLDN’s blog-promoted campaign of letters from servicemembers advanced the campaign that made sure repeal happened before the end of 2010. Regardless of our roles in the movement, we all need to get to a place where we see the difference between “I wouldn’t do that” and “We shouldn’t do that.” There might never be an orchestrator to “conduct” the movement at a meta-level above all of its players. If, however, we can trust each other and play off each other instead of playing against each other, we can truly work in concert toward the LGBT equality we all believe in. On Thursday, I was going through some of the day’s news and found a story about a lesbian couple who were harassed by a security guard at a Minnesota Twins game. Because the Twins had announced the day before they would be creating an “It Gets Better” video, it seemed important to highlight that videos don’t solve all problems. I was sitting next to my good friend Allison Palmer, GLAAD’s Director of Digital Initiatives, and I mentioned it to her; she hadn’t yet heard about it. We had a great off-the-record conversation (that I got permission to mention here) about the incident as two individuals with unique professional perspectives. Allison had some great ideas and opinions that I definitely incorporated into my post at ThinkProgress; my post was stronger because of my conversation with her. Shortly after Allison and I parted ways, I got an email from her colleague, Aaron McQuade (GLAAD’s Deputy Director of News and Field Media). Allison had let Aaron know about the story, and he contacted me to share some extra details from his direct interactions with the team and the commitment they’d made to GLAAD to rectify the situation. I incorporated them into the post, which had fortunately not yet been published. Then, shortly after my post went up, GLAAD published their post, crediting (and more importantly, linking back to!) my post on the story. Obviously, the tone of my post (“It doesn’t get better…”) was quite different from GLAAD’s (“Twins will reach out…”), but in exactly the ways that respect our unique goals as a blogger and an org. For this “small” story, both the blogger and the org were able to benefit from cooperation without compromising. » The blogger and someone from the organization had insightful, off-the-record conversation that highlighted both sides’ perspectives. » The org provided background info about its response to support the blogger’s story. » The blogger was given the opportunity to “break” the story first. » The org linked back to the blog to support the blog’s traffic. » Though the blog and org approached the story in different ways, the result was a synergistic response to the incident. At the end of the day, an incident of harassment at a baseball game is not going to be the revolutionizing political story of the year, but here it demonstrates how the “insiders” and the “outsiders” can work together toward the common goal of LGBT equality. 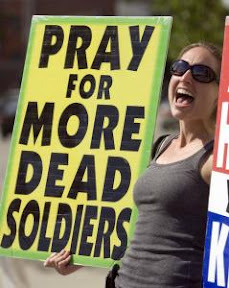 Say whatever you want about Fred Phelps and his Westboro Baptist Church. They won their right to protest, and I’m glad. It may be vile, but it’s free speech. But I’m going to go a step further and say that I’m also glad they get to continue protesting. Why would I be glad about a group of crazies continuing to spout anti-gay filth in incredibly insensitive settings? Because they are a stimulus that forces everyone else to react.